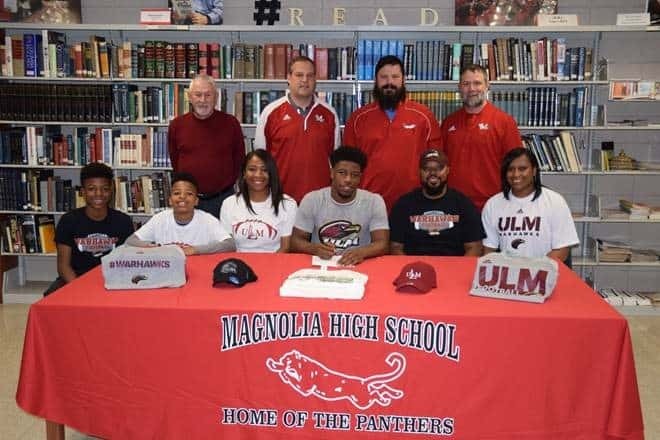 Magnolia High School senior, Kadyn Roach, recently signed a national letter of intent to play football for the University of Louisiana at Monroe during the 2019 season. Kadyn played running back for the Panthers the last three seasons and is the all-time leading rusher in school history with a total of 4473 yards on 482 carries. This year he rushed for an average of 149 yards per game and had five games in which he rushed for more than 200 yards. With a great work ethic on the football field and in the classroom, Kadyn has earned many honors. 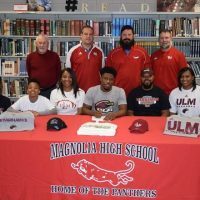 During the 2018 season, Kadyn was named to the 5A All-Conference and 5A All-State teams and has been named All-State each of his three seasons as a Panther. Kadyn also excels on the basketball court as a member of the Panther basketball team. During the 2017-18 basketball season, Kadyn was named to the All-Conference and All-State basketball teams.